If you want to succeed in building awareness around your property, driving traffic to your website, and converting online visitors into loyal guests, you have to be willing to invest in content. But in 2018, investing in content means more than just creating a blog and updating your social media pages. You have to do more if you want to differentiate from competitors, cut through the noise, and actually reach your target audience. The internet has never been more saturated before than it is today. Online consumers are being inundated with blog posts and organic and paid social content from businesses just like yours. These days in order to get any sort of ROI from your digital marketing efforts, you have to be willing to go beyond the blog post. You have to create different types of meaningful, engaging content that help people understand what makes your property unique and worth visiting. Blogging as a business isn’t as effective as it was ten, five, or even two years ago. The content strategies that used to work well for businesses in the past just aren’t as relevant or effective today. Online consumers are well-accustomed to the type of content that most businesses are publishing on their blogs. As algorithms change and paid promotion continues to become more expensive on social media sites like Facebook, you need to work harder than ever to get your content in front of the right people. That’s where long-form emails come into play. Historically, a lot of businesses—especially those in the travel industry—used email primarily as a channel to promote their business. They sent out promotions, deals, packages, and anything else that would get people in their target audience to click and convert. Today, business owners are becoming much more creative and thoughtful with email. They’re not just using email as a channel to promote themselves, but also as a channel that can be used to share rich, helpful, interesting, and original content. The goal? Building trust and nurturing relationships over time with leads. As a property manager, you have an opportunity to do more with email than you’ve done in the past. So, where do you start? Take a blog post idea from this list, and share it with your subscribers as a long-form email instead. 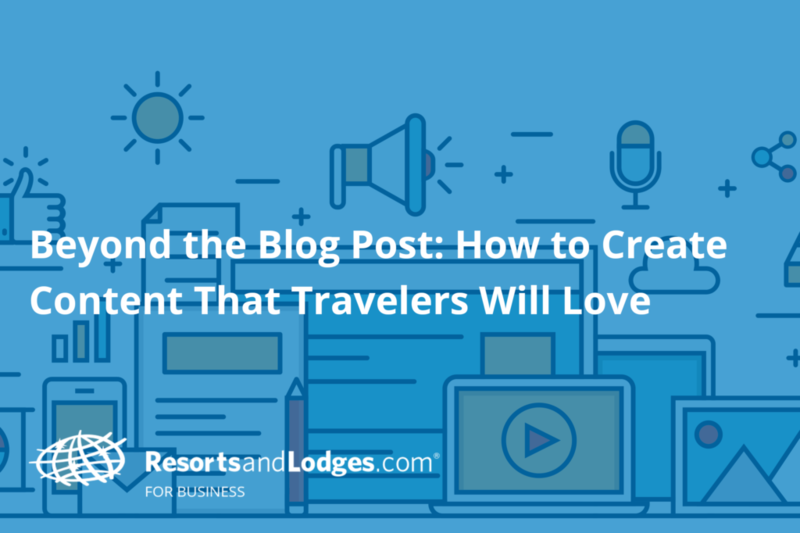 The idea here is instead of publishing a blog post and sharing it with followers on social media, you’re sending it directly to the inboxes of people that you know will appreciate it—people who have expressed interest in your resort or your content before. As a result of these changes, businesses have to work harder than ever to create content on Facebook that people actually want to engage with. One type of content that has been working well for a lot of businesses and influencers in 2018 is live video. If you’ve been seeing engagement numbers drop consistently over the past few months on your Facebook page, it might be worth testing Facebook Live. Wondering where to start? Go on Facebook Live and do a live Q&A about your property and the surrounding area with your followers. To ensure engagement and participation, promote your Facebook Live broadcast in the weeks leading up to your event. Encourage your followers to send you questions ahead of time, and ask them if there are any parts of your property that they’d like to see during your broadcast. Invite one of your other team members to join you as a co-host on your broadcast and have fun with it! Want to really go the extra mile? Boost engagement by hosting an exclusive raffle or giveaway during your Facebook Live. The right visual content can also help you effectively cut through the noise, reach your ideal guest, and compel them to learn more about your property. Why are visuals so powerful? The average person gets distracted in eight seconds, though a mere 2.8 seconds is enough to distract some people (Source). People form a first impression in a mere 50 milliseconds (Source). Visuals are processed 60,000 times faster in the brain than text (Source). Visual content can help you connect with your prospective guests in ways that text-only content does not allow. As a property manager, you should be creating and using visuals to engage with your target audience and differentiate from competitors. But here’s the thing: simply sharing photos of your resort is not enough to get people to notice you anymore—to get people to really pay attention and want to engage with you, you need to focus less on you and your needs and more on them and their needs. That’s where educational photos and original GIFs come into play. Both types of visuals allow you to share valuable, informative, or entertaining content in a way that is easily digestible and memorable to people. A photo or GIF that combines visuals and text to help people better understand what they should pack when they are preparing for their trip. A photo or GIF that details what ingredients are used to make the special welcome cocktail your employees hand to guests when they arrive to check in. A photo or GIF that lists 5 attractions worth visiting in your local area. To make a visual that combines photography and text, use Photoshop or a free tool like Canva. To make GIFs, use a tool like Giphy. Ready to start making original, compelling visuals for your target audience? Imagine that you receive a call from a prospective guest who asks you how they should pack if they plan on only traveling with a small carry-on bag. They only want to pack the essentials, but they also want to be prepared. How would you respond? Incorporate your answer into a visual (either using a list of text or photos of the items you would recommend they pack), then share your original image with your followers. In 2016, SEO influencer Rand Fishkin coined the term 10X content to describe and categorize content that goes way, way beyond the standard blog post. 10x content refers to the intentional effort to create a piece of content or a resource that is ten times better than anything else available on the internet. Rand makes the argument that the internet is completely saturated with ‘just-good-enough’ content, and that in order to stand out, you need to create something truly great for your audience. One type of 10X content that more businesses are creating today is what is known as a content hub. A content hub is essentially a long-form landing page that combines text, photos, videos, GIFs, animations, drawings, links, and other types of media into a single resource that readers can visit and leverage when they want to learn more (a lot more) about a very specific topic. Content hubs also typically target a specific keyword phrase that the creator wants to rank for in Google or another search engine (you can learn more about this particular SEO strategy by digging into this resource from HubSpot). Content hubs can enable you to drive more traffic to your property website (through SEO and link-building), leverage yourself as an influencer on the topic you’re writing about, and build trust with travelers and your prospective audience. Interested in finding out how a content hub could impact your website traffic, lead generation, and online reservation sales? Think of a topic you want to 10X on your website. Start by brainstorming topics you know your audience cares about, then back your idea up with some keyword research. Build an outline for your content hub and start thinking about what types of media you would also link to incorporate into it. An example of a content hub would be something like, “Everything You Could Ever Possibly Want to Know About Traveling to the American Southwest.” In this example, you might include photos, maps, lists of attractions, paragraphs describing certain areas or highlights, timelines, videos, links to other photo galleries and blog posts, and maybe even some original illustrations. 26 percent of Americans—73 million people—listen to podcasts at least monthly (Source). For Americans between the ages of 12-24, it’s closer to 30-32% (Source). 16 million people in the US are “avid podcast fans” (Source). Advertisers put $314 million into podcast ads in the U.S. last year (Source). As more people continue to rely on smartphones as their preferred tool for finding and consuming content, and as more smart speakers enter the market, podcasts continue to grow in popularity. Start by reading this fantastic resource on how to start a podcast for less than $100. Think about a theme for your podcast. What do you want to be known for? What topics do you want to cover? Who do you want to interview? What do your guests care most about? For example, is it meditation? Rock climbing? Trying new foods? Think about it and come up with a working theme that you can run with for your podcast. From there, refer back the the resource mentioned above and follow the steps until you have a working podcast that you can promote to your prospective guests and followers!